The crowd drew from the two artists’ distinct fanbases. Much of Dawg’s fandom come from his association with the Grateful Dead. Parklife DC Ari Strauss remarked that he saw some tye-dye, and we shared our table with two young Deadheads who work as research scientists. 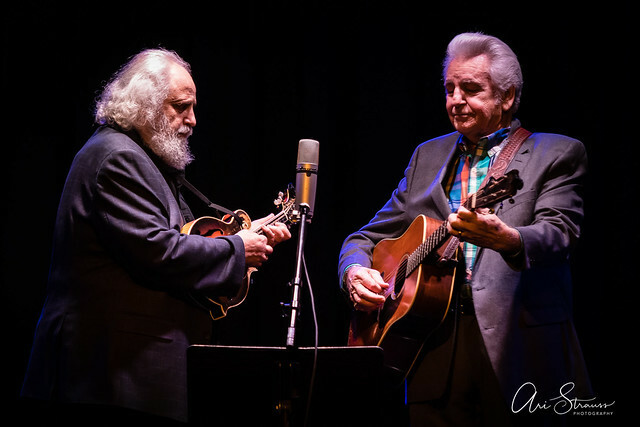 The Grateful Dead introduced many of their fans to American roots, folk, bluegrass, and country music; today, the Dead would easily join the Americana family. 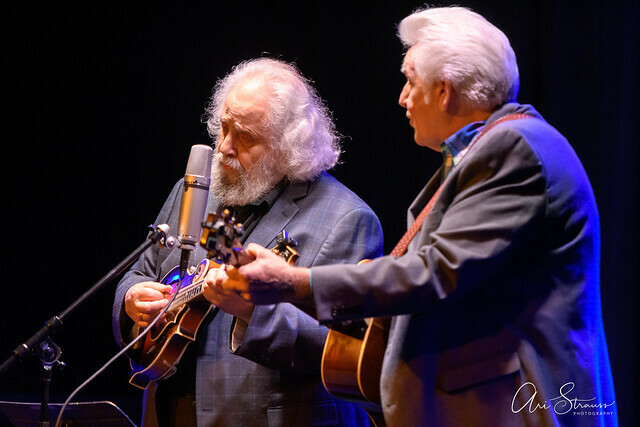 Del & Dawg played a lot of a traditional bluegrass, especially songs by Bill Monroe, opening with Bill’s “Have a Feast Here Tonight.” After the song, Dawg told the audience this was the duo’s first engagement of the year. 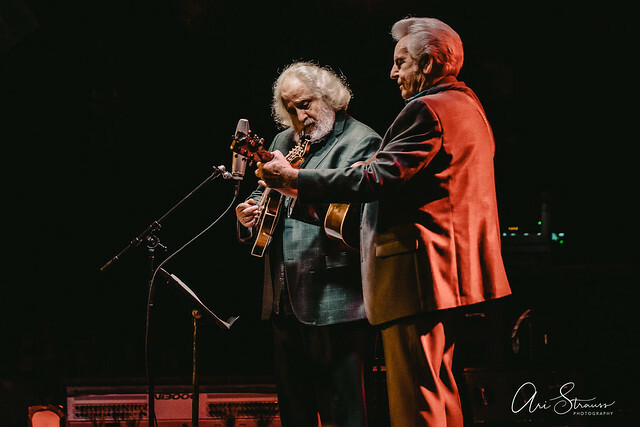 Del had just turned 80, and the two first met in 1963 on Del’s first night playing with Monroe, when he played the five-string banjo. The instrumental “G Run Blues” featured Del’s playing. 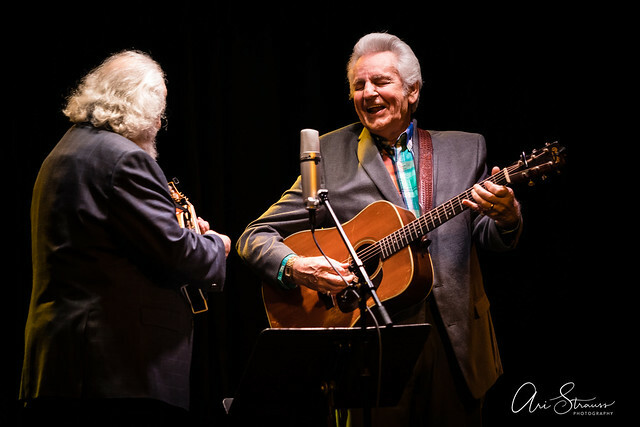 Dawg said, “You can’t love bluegrass without loving Bill Monroe,” and he prompted Del to tell a story. 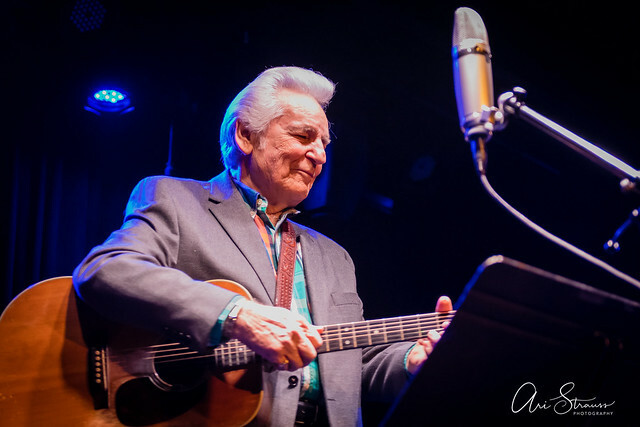 I cannot begin to capture Del’s story, as deep and winding as the very roots of American music. 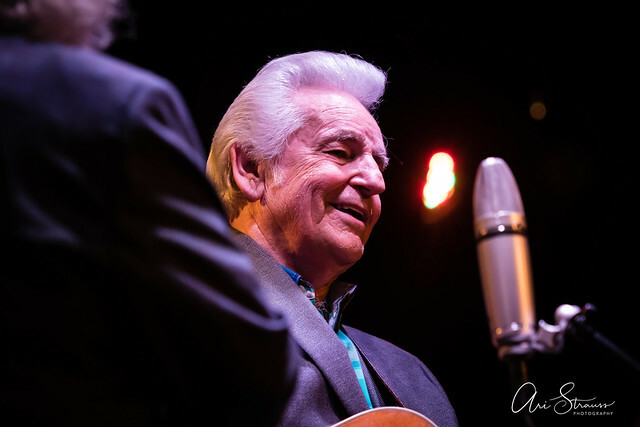 Del took the audience to the learning tree, casting a powerful spell with his vast lifetime of experience, his genuine warmth, and his deep love for the music. 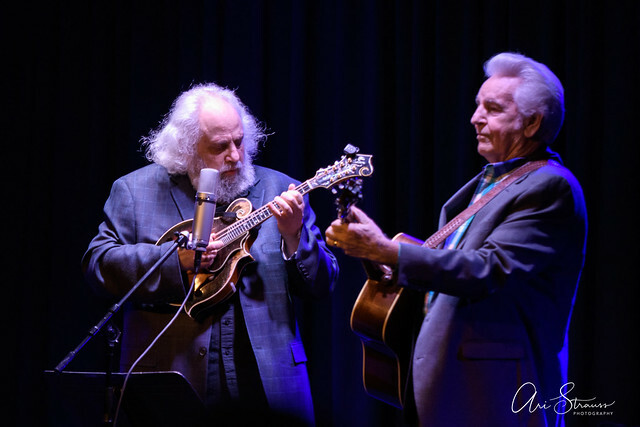 After playing “Toy Heart,” Dawg spoke more about how Del got to be the guitarist for Bill Monroe’s band. 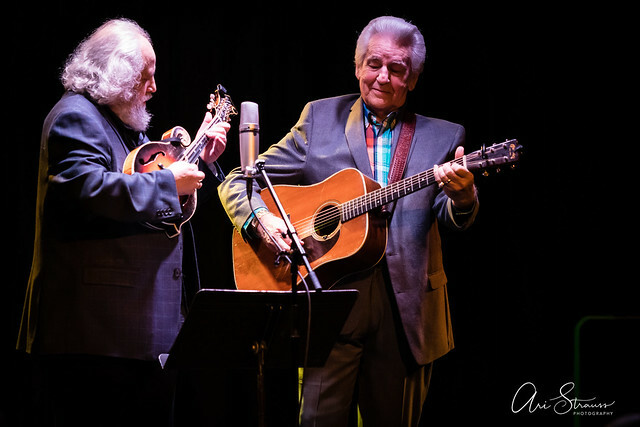 After Monroe offered him the gig as banjo player, Del hesitated for a few months. 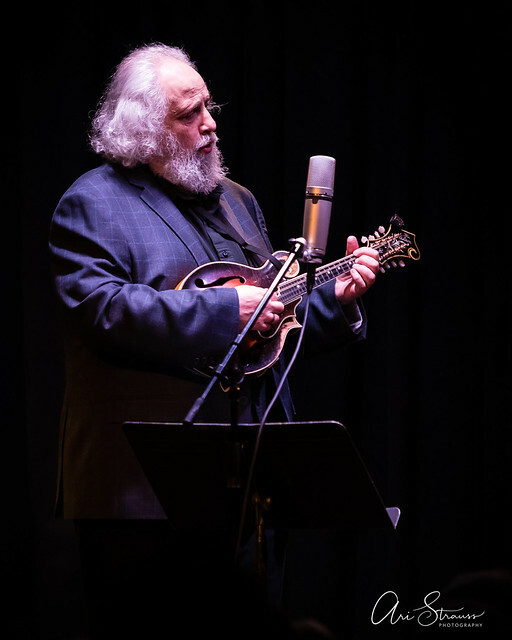 When he finally got to Nashville, Bill Keith also had been offered the position. 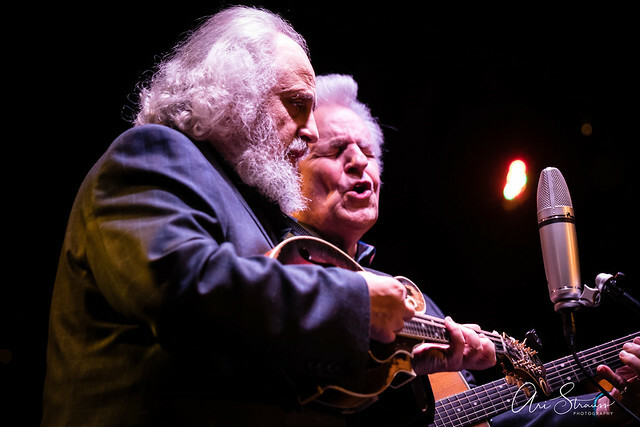 Monroe also needed a guitarist by then, so he auditioned the two men on both instruments. 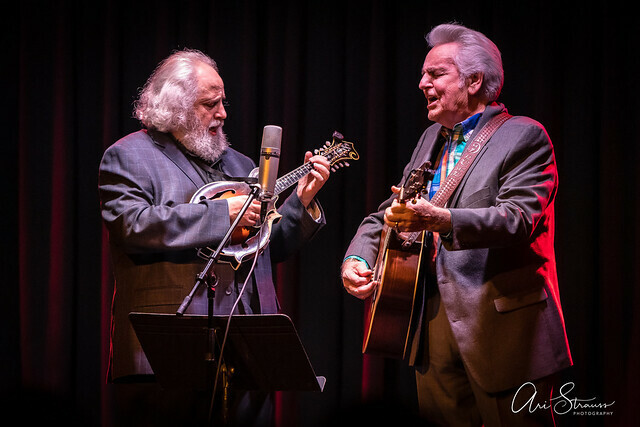 Del got the guitar spot, and Keith played banjo. 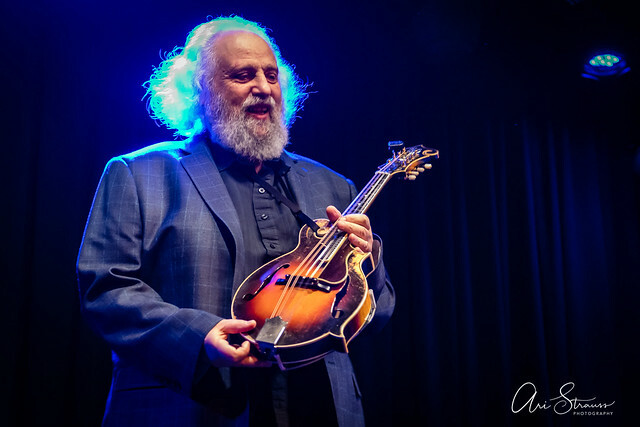 Dawg said that modern-day banjo virtuosos like Béla Fleck stand on Keith’s shoulders. 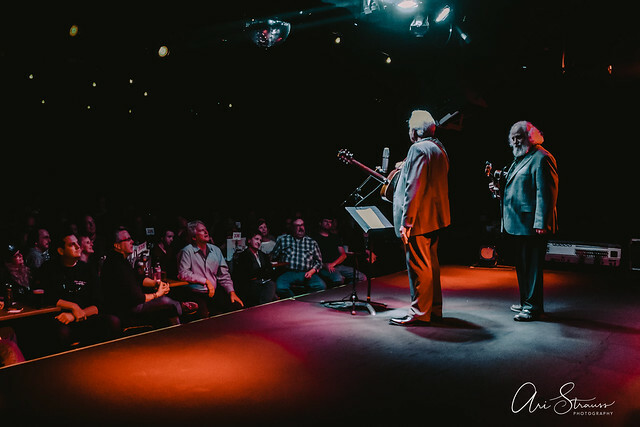 Continuing on, Dawg told the audience that Monroe always featured his guitarist/singer early in his set, usually on the second set. 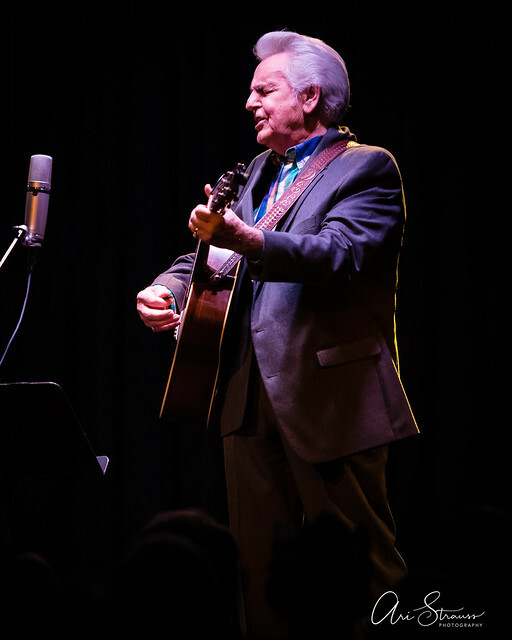 “Dark Hollow” spotlighted Del, who sang alone on the song. 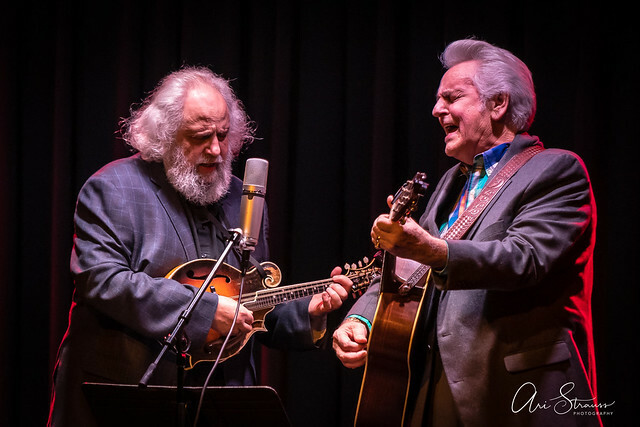 Dawg remarked about the next song, “This one is many ways worse than murder, but we like it.” He said that while many bluegrass murder ballads have uplifting music, “Snow Dove” does not. There was some discussion of their CDs for sale, and Del said CDs are a a good investment. “CDs, CBDs,” quipped quipped Dawg. “We’d be happy to mutilate them for you,” he said, referring to signing them. 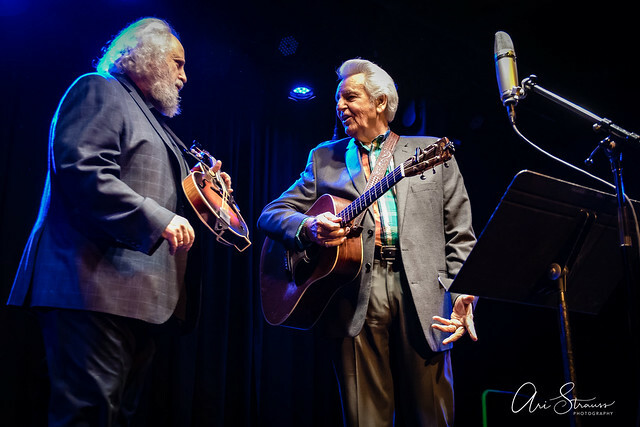 They played their theme song, “Del & Dawg,” followed by “Letter from My Darling,” a Bill Monroe tune, and finished with “New River Train.” Dawg wrote a seventh verse to this tune by, I was surprised to discover, Raffi. 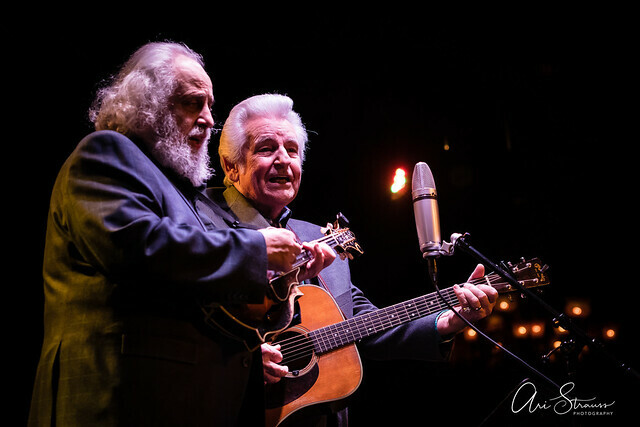 Del and Dawg put on an absolutely inspiring encore. Beginning with the Gospel tune “Weary Pilgrim, Welcome Home,” they slipped into the tune of the Hebrew song “Shalom Aleichem.” “Shalom Aleichem,” means “peace be upon you,” and it is a traditional song sung upon returning home from synagogue after Sabbath evening prayers on Friday night. 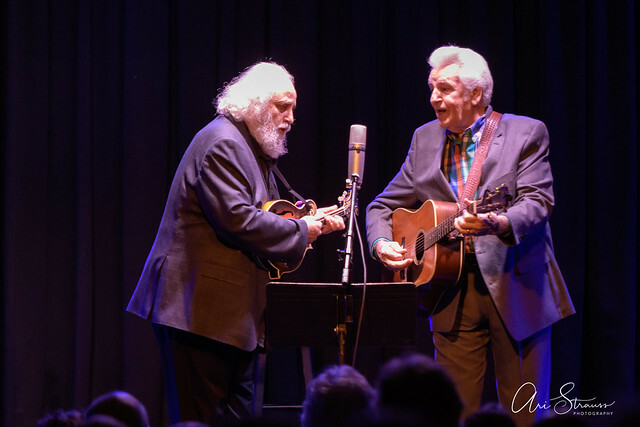 I’d never heard Jewish music put to bluegrass instrumentation before, and it was deeply moving to hear these perfectly matched songs, Christian and Jewish, paired together. 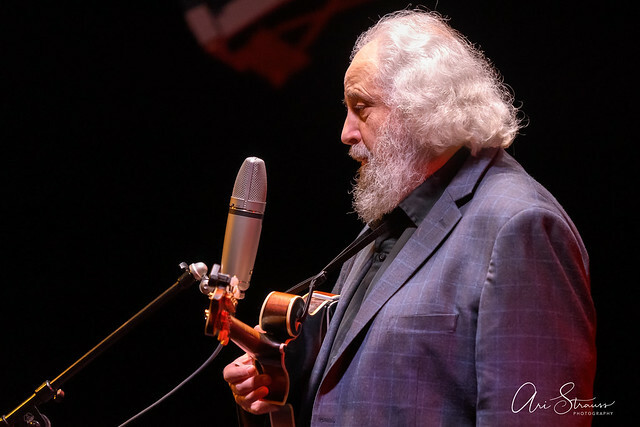 This is essence of Americana, weaving rich, beautiful music from the diverse threads of our culture. 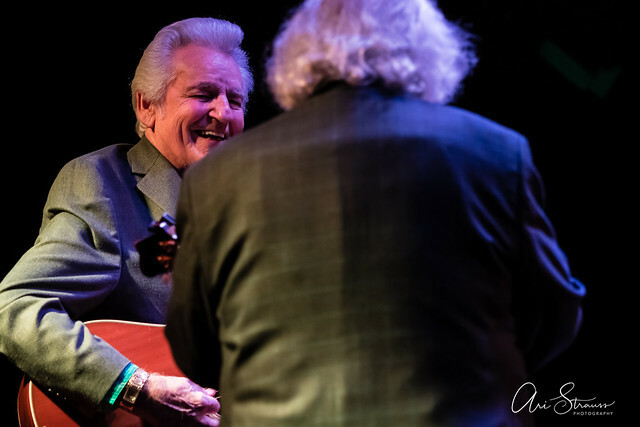 Here are some pictures of Del & Dawg, or Del McCoury and David Grisman, performing at The Birchmere on March 15, 2019. All photos copyright and courtesy of Ari Strauss.